It’s interesting for me to see what’s going on with new Windows releases as they emerge from the Insider program and make their way to the general public. The latest Windows version, 1803, hit the streets on April 30, 2018. As Kari relates in another post here, 1803 is already up to 250 Million installations, a mere six weeks after public release. (Reported in a Windows 10 blog post on June 14.) Even if we assume 20 million prior installs through the Insider Program, that’s a run rate of nearly 40 million installs per week. Wow! Yet if you follow the busy Windows 10 forums, such as social.microsoft.com, superuser.com, answers.microsoft.com and our favorite, TenForums.com, you’ll see that there are plenty of people having problems with 1803. I have to speculate that, given a user population of a quarter billion, there are going to be problems in some percentage of that group. Even 0.1% of 250 million is still 250,000, so a problem rate of 1 in 1,000 means that a pretty large number of people are going to be reporting issues and gotchas. Lord knows, I’ve run into a few of them myself, including issues with networking (getting 1803 nodes visible on the network requires jumping through some relatively easy hoops, for example), and I’ve run into a small number of device driver related issues as well. Thus, we see stories like this one widely covered in the trade press “Windows 10 update pain: Microsoft must do more for consumers.” British tech support company, Which.co.uk (aka Which?) reports on contacting 1,100 Which? members in March 2018 who use Windows 10. 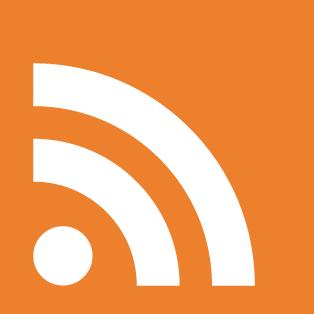 It also reports that “[h]alf had experienced some kind of issue or problem with the software.” Likewise, computer trade press writers (like me) see a seemingly high and endless procession of complaints on the aforementioned user forums. One might be tempted to conclude that Windows 10 in general, and 1803 in particular, is sub-standard software, subject to an unusually high number of issues, problems, gotchas, and outright bugs. Early returns are very positive: With over 250 million machines on the April 2018 Update, we are seeing higher satisfaction numbers, fewer known issues, and lower support call volumes compared to previous Windows 10 releases. How can we explain these contradictions? Easily! For one thing, Which? is “an independent, charitable social enterprise” part of whose income comes from selling information on which products consumers should pick, and part from providing for-a-(modest)-fee technical support to those selfsame consumers. I don’t wish to ding or ipugn Which? in any way, but it’s not a big stretch to presume that people who become Which members fall on the less-savvy side of the technical spectrum. Thus, when Which? surveyed those 1,100 members to get the 50% problem rate, there was some selectivity in gathering the population subjected to its questions. Which? has not yet shared the questions it asked those members, but their description starts with “half had experienced some kind of issue or problem with the software” (emphasis mine). “Common complaints” reported included software compatibility (21%), devices no longer working (16%), email not syncing, removal of non-MS software (the upgrade installer always does this for incompatible software), significant slowdowns, and “other,” which I’m guessing includes a long tail of more idiosyncratic issues. I also note that based on the percentages provided here and pie chart that serves as the anchor graphic for this blog post (copied from the afore-linked Which? 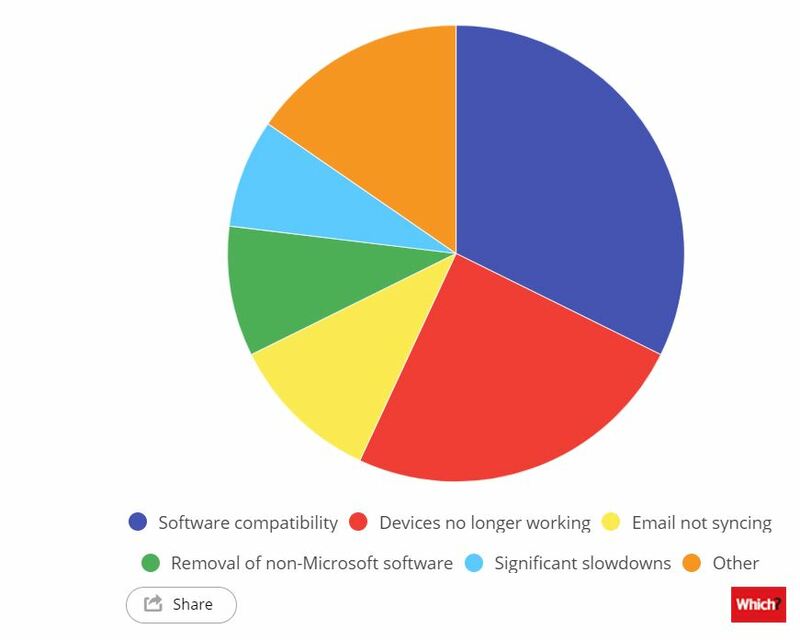 survey report piece) look a little different than the numbers indicate they should be (compatibility is definitely over 25% as depicted, and devices no longer working appears to occupy almost exactly 25% of the pie chart’s real estate). Weird. The same kinds of things pop out when one surveys the popular, heavily-visited user forums where Windows users turn for help online. As somebody who spends upwards of two hours a day, six days a week, at TenForums.com answering such posts as I can, I’ve got a decent idea about the kinds of things Which? heard from its users. But people turn to these venues when they have problems, not when things are going well. So those entire populations are self-selecting, too. They simply don’t reflect the entire user population, including those who upgraded to or clean-installed 1803 with little or no problems. On the other hand, MS has telemetry data from the vast majority of those 250 million users who’ve upgraded to 1803 (and for most of the users of modern Windows versions back to Windows 7, in fact). Thus, when Cable says that 1803 enjoys “higher satisfaction numbers, fewer known issues, and lower support call volumes” I’m inclined to believe him. It’s just that we hear about problems far more often than successes, and we don’t have as much information about the whole population of Windows 10 users as we (or at least, Kari and I) might like. I will conclude with some personal observations. I’ve got 9 computers at my house right now, six running 1803 and three running Insider Preview Build 17692.1000. Sure, I’ve run into some minor gotchas with these units and have been able to work through a couple of more serious, time-consuming issues as well. But, all in all, my experience is indeed mostly positive and I have a good opinion of Windows 10 in general, and of 1803 in particular. But then, I’m not a “typical” Windows 10 user, either! So please, make of this what you will. I submit, however, that 1803 ain’t half bad, and works well enough for me to be comfortable inflicting it on my family, as well as using every day myself.